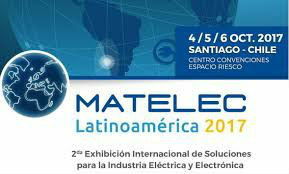 International MATELEC Latinoamerica fair gathers suppliers of electronics, automation, and those from the energy sector. Its previous edition attracted exhibitors from 20 countries and more than 4,000 visitors. Both commercial entities and representatives of the public sector presented their offers. The fair was accompanied by a thematic congress with local and international experts’ participation. Organisers are expecting this year’s event to be just as fruitful and appealing to its participants. We invite you to stop by our stand 306-MT! 4–5.10.2017: 10:00 a.m. to 6:00 p.m.
06.10.2017: 10:00 a.m. to 5:00 p.m.